Start Traditional starting location. From the intersection of highways 50 and 89 in South Lake Tahoe, drive 4.7 miles northwest on Highway 89 to Spring Creek Road and turn southwest (left) onto it. Drive 1.0 mile to the end of the road and the starting point (mileage point 15). In recent years a gate at the bottom of Spring Creek Road has been locked during the winter months. This parking area fills quickly. The next closest parking area is 0.5 mile east at another plowed turnout (mileage point 16). End Fallen Leaf Road. From the intersection of highways 50 and 89 in South Lake Tahoe, drive 3.1 miles northwest on Highway 89 to Fallen Leaf Road. Turn south (left) onto Fallen Leaf Road and drive for 2.0 mile until you reach the junction with Tahoe Mountain Road (mileage point 13). There will be a locked gate here. The summit of Mt. Tallac is predominantly the destination of telemark and AT skiers seeking the very steep descent down the northeast bowl – almost 3000 feet in just over one mile. But backcountry skiers can visit the summit to take in the astounding panorama and then descend down the more modest southwest ramp to Gilmore Lake and finally to Fallen Leaf Lake. From the summit, almost within reach of your outstretched arm, are dazzling blue Lake Tahoe, Cascade Lake and Fallen Leaf Lake. Across Lake Tahoe is the Carson Range. Turn around and Desolation Wilderness lays before you with Pyramid Peak looming on the horizon. While this tour is still rated advanced, the very steep section is uphill and the accomplished skier can enjoy the wide-open, modestly steep, 1400-foot descent to Gilmore Lake. Beyond Gilmore Lake you must pick your way down to Glen Alpine Spring and then follow a road to Fallen Leaf Lake. The tour ends with either a 2.6- or 3.1-mile ski or hike on roads to one of the two end points. Whether it is a ski or hike depends on the snow conditions on Fallen Leaf Road. The best ending point for the tour is at the junction of Fallen Leaf Road and Tahoe Mountain Road provided snow does not block your way. The alternative ending point is 0.5 mile farther and up Tahoe Mountain Road. Mt. Tallac is such a popular destination today that Spring Creek Road development, the traditional starting point for this tour, has been closed in winter to all but the residents. The result is that the traditional starting point has been replaced with a new one on Highway 89 as described in the summary section for this tour. Of course you can carry your equipment to the traditional starting point to begin the climb from there, but few if any do so it is not described here. This tour begins by ascending to the summit of Mt. Tallac by the most direct route. It is also the steepest. 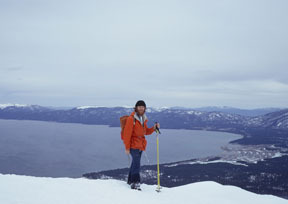 An alternative route to the summit is described in the Mount Tallac Via North Ridge tour. Although the ridge route is not quite as steep, surprisingly it is 1.1 miles shorter however you will have to walk 1.1 miles from the parking location to the beginning of the tour. The big question is when is the best time to ski this tour? Fresh powder on the upper south-facing slope turns to mush fast so don't try for powder conditions. But the slope consolidates and corn-snow forms fast so try to pick a time when you can find these conditions. You will find the best snow over the largest part of this tour if you ski it the earliest you can in the season. Late in the spring the south-facing slope can turn to mush if you do not get there early enough. Worse, down near Glen Alpine Spring there are areas where the snow can become water logged and there can even be standing water. So pick your time carefully. Descend southwest for 1.2 miles until you reach Gilmore Lake (8). Ski south along the east (left) side of Gilmore Lake's outlet creek for 0.4 mile until you reach the approximate location where the summer trail crosses the creek (9). 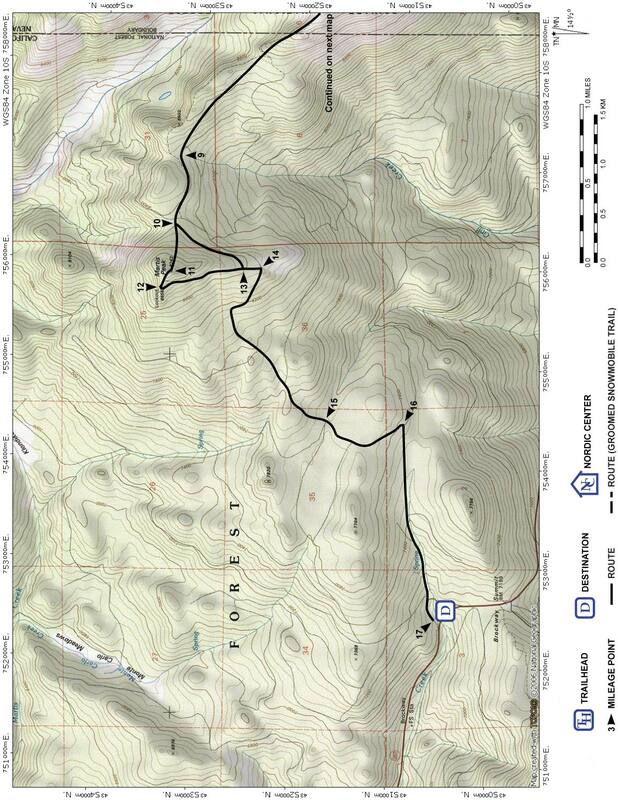 Cross the creek and descend, making a loop first to the west and then to the southeast, for a total of 0.6 mile until you reach the creek (10) once again. 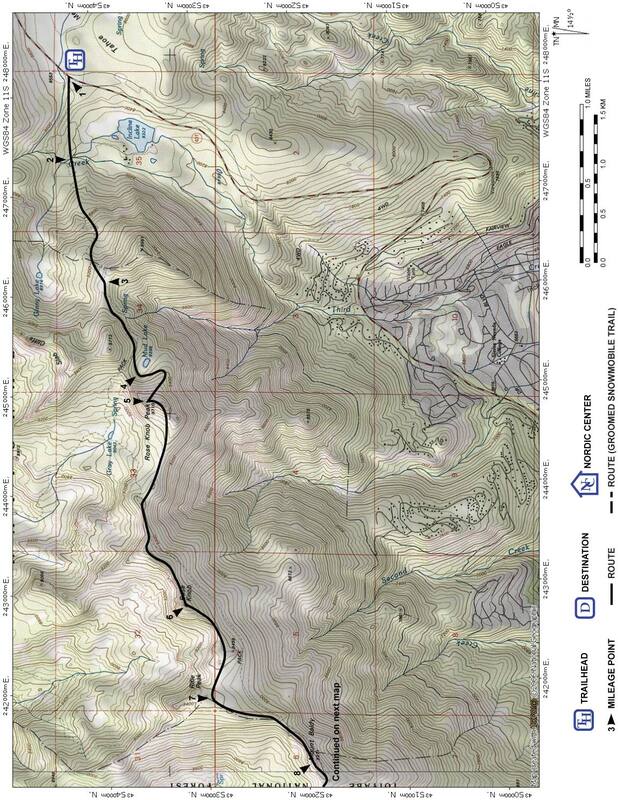 Cross the creek and descend southeast and then east along the north (left) side of the creek for a total of 1.2 miles until you reach a cabin at Glen Alpine Spring (11). At Glen Alpine Spring you must locate the road that heads east. Descend east on the road for 1.9 miles until you reach the south end of Fallen Leaf Lake (12). Ski generally north along the east side of Fallen Leaf Lake on Fallen Leaf Road for 2.6 miles until you reach the junction with Tahoe Mountain Road (13). This is the end of the tour if you have left your vehicle here. If not, continue as described below. Turn east (right) onto Tahoe Mountain Road and climb for 0.5 mile until you reach the end point (14).